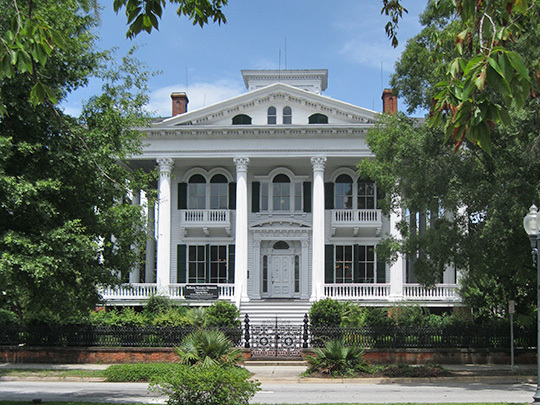 Wilmington City Hall is located at 102 North 3rd Street, Wilmington, NC 28402; phone: 910-341-7800. Photo: Bellamy Mansion, ca. 1860, 503 Market Street, Wilmington, NC. Listed on the National Register of Historic Places in 1974. Photographed by User:Jameslwoodward (own work), 2012, [cc-by-3.0 (creativecommons.org/licenses/by/3.0)], via Wikimedia Commons, accessed September, 2013. Wilmington, North Carolina, situated on the elevated east side of the Cape Fear River, twenty-seven miles north of the point where it flows into the Atlantic Ocean, has been the focus of an important lumber, turpentine, shipbuilding and cotton producing region of the state for more than 275 years. From its incorporation, in 1739, the town grew steadily over the succeeding century until it reached a population of 10,000 residents by 1860. For much of the period the city depended on river traffic to ship valuable cargos along the Atlantic seaboard and across the ocean to European ports. With the increase in trade, civic-minded leaders envisioned a city distinguished by fashionable architecture reflecting their self-esteem, economic prosperity and cultural awareness. They sought out architects and builders from as far away as Massachusetts, Connecticut, New York and Pennsylvania to enhance the character and appeal of the port city. Despite setbacks such as disastrous riverside fires, yellow fever epidemics, the Civil War and Reconstruction, the city prospered, and continued to rebound with determination in times of depression and progression. Until 1870, Market Street, the main land route into and out of the city, extended only as far as Seventeenth Street where it became a country road passing through farms, fields and woodlands. Two diverging roads ran northeast to New Bern and southeast to Wrightsville Beach. Streetcars, however, were available within the city limits and a steam train carried passengers and freight to the beach communities. The Wilmington Street Railway system was installed in the 1870s, and stables for the horses drawing the cars were erected near the corner of Seventeenth and Market streets (Wilmington Star, 11/13/1877). The conversion from horse-drawn cars to electric-powered trolleys occurred in 1892. A decade later, Wilmington entrepreneur and engineer, Hugh MacRae, acquired both the city streetcar lines and the Wrightsville beach line, forming the Consolidated Railways Light and Power Company. This became Tide Water Power Company in 1907. In May of that year, the line along Princess Street to Seventeenth and then south to Castle Street had a second pair of tracks installed. By mid-June, the newspaper reported that the double tracks from downtown, at Front and Princess streets, out to Carolina Place and on to the beach, had been completed (Wilmington Star, 6/2/1907). Edward F. Turberg, Architectural Historian, Westbrook-Ardmore Historic District, New Hanover County, North Carolina, nomination document, 2008, National Park Service, National Register of Historic Places, Washington, D.C.